This is another spiritual-sounding excuse, but to think that we can outrun God seems a bit silly to me. Can you imagine God in Heaven huffing and puffing and leaning on Gabriel’s shoulder as He says, “Man, I wish that guy would slow down. He’s so quick I can hardly keep up with him!” More than likely God has been waiting on you to catch up rather than the other way around. Any one of these points could be qualified with a list of caveats, but rather than thinking of all the instances when this concern could be legitimate, ask yourself, “Am I using this as an excuse in my life?” And if it is indeed an excuse, no matter how spiritual it sounds, you need to drop it and get moving in Jesus’s name! Financial needs are one of the most practical barriers to fulfilling our dreams. Many times the money issue boils down to a faith issue. 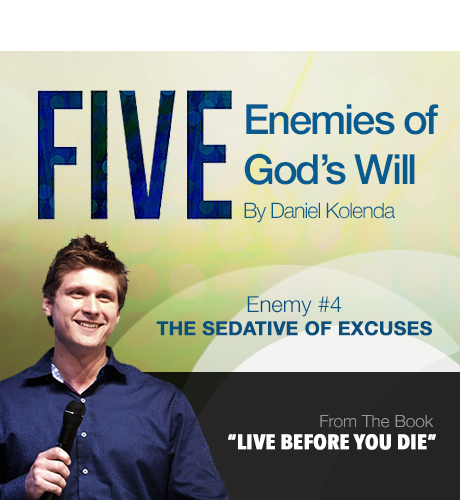 We make excuses because we are not fully convinced that God will provide for our needs. The next few sentences will change your life and even your destiny if you will allow them to sink deep into your heart. God is not poor, and He has no need of anything. When He orders something, He will always pay for it, and He never expects us to finance His will on our own. When God wants something, He never asks “How much?” because cost is no issue to Him. The only thing that governs what God can or cannot do in our lives is our willingness to believe Him, trust Him, and obey Him. Never decide what is or isn’t God’s will in your life by looking at the money that is or isn’t in your pocket. Check God’s pockets! They are filled with more than enough! I realize that not everyone reading this book is called into “full-time ministry,” but let me take a moment to speak to those who are, because for them the matter of finances is perhaps one of the biggest challenges and sources of confusion. Ministry today is often viewed as a profession. We have been reminded quite often that “the labourer is worthy of his hire” (Luke 10:7) and that we should not muzzle the ox when he is working (Deut. 25:4). When I preach about the call of God into the ministry, the first thing most people think of are paid positions, and they immediately begin to wonder about what level of financial support they might find. It seems many people automatically think of “ministry” as a paying “full-time job,” and I wonder sometimes how much interest there would be if there were no possibility of financial reward. When God sent Malachi to Jerusalem shortly after the temple had been rebuilt, he was appalled by the apathy of the people and especially of the “clergy.” He observed that the priests seemed to be motivated by what they could get out of their service rather than by sincere love for God and a desire to build His kingdom. They were hirelings and mercenaries working for pay. God wondered if anyone would still be there to light the fires on the altar or even shut the doors if there were no promise of financial compensation (Mal. 1:10). I have no problem with ministers who make a living from their work in the ministry. In fact, I am one of them. But if financial remuneration becomes the incentive or prerequisite for ministry, there is a real problem. I started preaching when I was fourteen years old, and ever since then I have always worked in “the ministry” in many different capacities. Most of the time I have been in ministry, it has been totally volunteer and has even cost me dearly. I have had to work secular jobs to support my family. Even as a senior pastor I took no salary and never felt entitled to anything. If there were no money in ministry, I would still be doing it today and for the rest of my life. Why? Because I love Jesus and because it is what He has called me to do. I cannot imagine not ministering. Ministry is not my job—it is my life. I am a minister—it’s not just what I do. I am amazed sometimes to think that today I am able to make a living doing something that I love so much. Jesus told His disciples, “My food is to do the will of Him who sent Me” (John 4:34, nas). This is reward enough. It is remuneration enough. And then He gave this exhortation: “Do not work for the food which perishes, but for the food which endures to eternal life” (John 6:27, nas). As ministers we work not for money or for food; we work for Jesus. Money will follow ministry, and as we seek first the Kingdom of God, all these things will be added to us. There are many people who wait until “they can afford it” to do the thing God has called them to do. They have somehow convinced themselves that funding God’s will for their lives is their responsibility. They’re wrong about that. It’s God’s responsibility, and He is more than happy to take care of it. In the meantime do what He is calling you to do, in whatever way you can, and stop using money as an excuse. Resurrection Sunday - Jesus is Alive!